FIONE Tan's (above) computer business grew out of a virus. The Sars virus. The 28-year-old Malaysian who lives in Kuala Lumpur started an online company and the first item sold was a Sars mask. "We put it on sale just as a trial," Miss Tan said, "and we sold US$2,000 ($3,250) worth in a rush." The Iowa uni grad in management and marketing is CEO of e1Net which she founded in 2000. She is ranked the No 1 Internet marketing coach by Google. The business-like chatty girl is her own best customer. "Today you can own the lifestyle you want, you can buy and sell almost anything online." 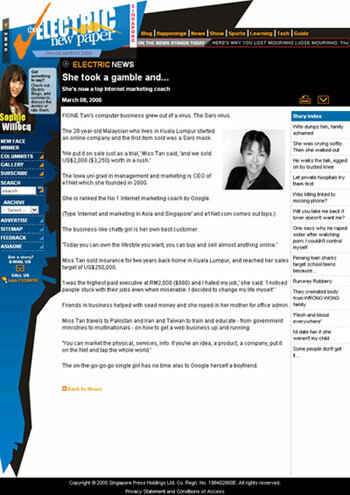 Miss Tan sold insurance for two years back home in Kuala Lumpur, and reached her sales target of US$250,000. 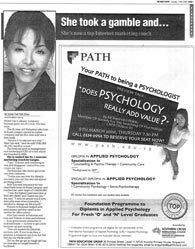 "I was the highest paid executive at RM2,000 ($800) and I hated my job," she said. "I noticed people stuck with their jobs even when miserable. I decided to change my life myself." Friends in business helped with seed money and she roped in her mother for office admin. Miss Tan travels to Pakistan and Iran and Taiwan to train and educate - from government ministries to multinationals - on how to get a web business up and running. "You can market the physical, services, info. If you’ve an idea, a product, a company, put it on the Net and tap the whole world." The on-the-go-go-go single girl has no time alas to Google herself a boyfriend. Article also available at The Electric New Paper, Singapore.